Juvenile Justice: A Social, Historical, And Legal Perspective 4 Edition A Fully Revised And Updated Edition Of The Essential Juvenile Justice TextbookThe Juvenile Justice System Is A Multifaceted Entity That Continually Changes Under The Influence Of Decisions, Policies, And Laws. Juvenile Justice: A Social, Historical, And Legal Perspective, Fourth Edition Is The Most Comprehensive Reference On The Juvenile Justice System Available. Reader-Friendly But Thorough, The Text Contains The Most Up-To-Date Research On Juvenile Justice Operations And Their Effectiveness And Is Authored By Two Experts In The Field. 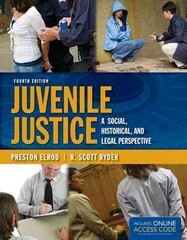 It Presents Contemporary Topics In Juvenile Justice And Situates Them Within A Historical And Theoretical Context, Covering Juvenile Justice History, The Development Of The Juvenile Court In The U.S., And Contemporary Juvenile Justice Practice, As Well As Chapters On Status And Violent Offenders, And Working In Juvenile Justice. Myth V. Reality Boxes, FYI Boxes, And Comparative Focus Boxes Provide Students With Important Information, Challenge Preconceived Ideas Students May Have About Juvenile Justice Practice, Critically Examine Juvenile Justice Practice, And Maintain Student Interest.The Fully Revised And Updated Fourth Edition Includes The Latest Statistics And Research Data, New Photos And Figures, Coverage Of Contemporary Court Cases, And New Pedagogical Features. Ideally Suited For Undergraduate Students In Juvenile Justice Courses, As Well As Graduate Students And Professionals Seeking A Comprehensive Juvenile Justice Reference, Juvenile Justice: A Social, Historical, And Legal Perspective, Fourth Edition Is The Leading Juvenile Justice Textbook On The Market Today.